The first national signing day is quickly approaching. Recruits in the 2018 class can sign national letter of intents starting Dec. 20 instead of waiting until February. Some may still wait until the first week of February to announce decisions, but most colleges, including Texas, would prefer to lock in the 2018 recruiting class before the new year. Texas’ 2018 class is 18 members deep and ranks second in the nation, trailing only Ohio State. Fourteen of those players are from Texas. Tom Herman hasn’t shown a fear of recruiting out of state and he hosted three prep players on official visits for the Texas Tech game. It’s no secret that offensive line is Texas’ biggest need. That will likely be compounded if junior All-American Connor Williams forgoes his senior season and enters the NFL draft. Texas holds commitments from prep tackles Reese Moore (Seminole) and Rafiti Ghirmai (Frisco Wakeland) and would like to add at least one more before national signing day. It appears Angilau is strongly considering Texas along with Utah, Oregon and USC. Utah and Texas could be in a dog fight for his signature down the stretch with Utah holding the hometown advantage. The Longhorns were able to get the big tackle on campus and show him the lack of depth at the position. The stellar junior season turned in by Malik Jefferson means the Longhorns will likely lose him to the draft. That means an extra scholarship would be open at the position for Texas. Byron Hobbs (Fort Worth Eastern Hills) and Ayodele Adeoye (IMG Academy, Fla.) are the two current linebacker commits. Texas would like to add a third and Clark, a 4-star committed to LSU, would give the Longhorns a true middle linebacker prospect in the class. Hobbs is a sure-fire outside linebacker and Adeoye is also considered a player who could slide outside once he arrives. Clark also gives Texas a backup plan if Adeoye flips before signing day, which is always a concern with out-of-state commitments. It’s never easy to get a flip from an LSU commit from Louisiana, however. Defensive end is a glaring need in a class that’s otherwise well-rounded. The Longhorns’ lone defensive line commit is Keondre Coburn, a 4-star defensive tackle. Texas defensive coordinator Todd Orlando relies more on hybrid tackles and linebackers than true defensive ends, but that doesn’t mean the Longhorns aren’t searching for a pair of bodies at the position. Jackson is a big-bodied lineman who’s currently committed to Louisville. He’s played tight end, defensive end and defensive tackle. His size fits perfectly into the position Malcolm Roach plays. 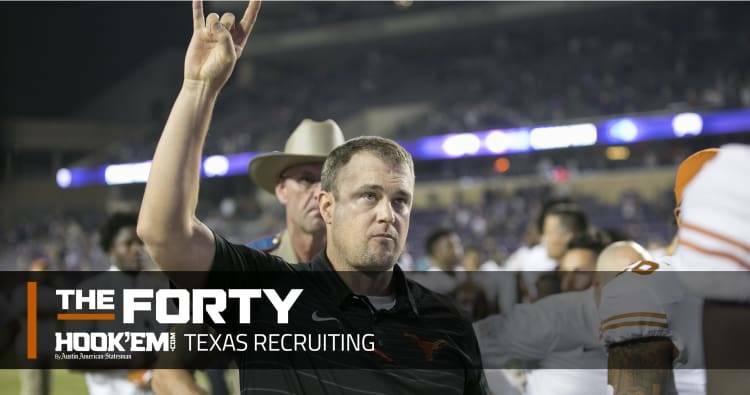 The post Texas hosted three out-of-state official visitors against Texas Tech appeared first on Hook ‘Em.